In stock -This product will ship today if ordered within the next 10 hours and 57 minutes. 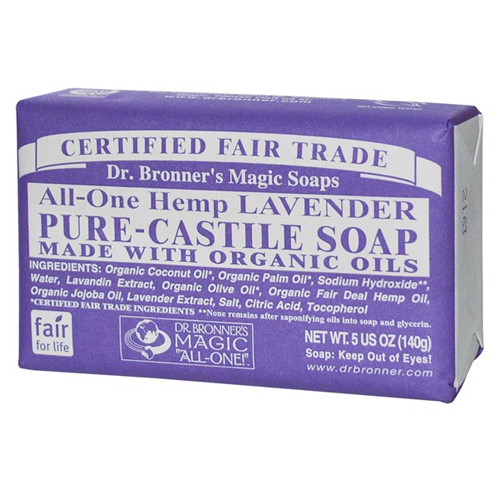 Dr Bronner`s Organic Lavender Castile Liquid Soap contains a combination of organic extra virgin coconut, olive, jojoba and hemp oils, together with pure essential oils to create a unique soap that cleans effectively without being aggressive. A relaxing fragrance for tired and stressed-out souls, lavender calms the nerves and soothes the body. Perfect just before bedtime or to start your day out with a tranquil peace of mind. Water, Organic Coconut Oil*, Sodium Hydroxide**, Lavandin Extract, Organic Olive Oil*, Organic Hemp Oil, Organic Jojoba Oil, Lavender Extract, Citric Acid, Tocopherol. Wet skin and massage the bar of soap between the palms to create a lather. Rinse, pat gently to dry. 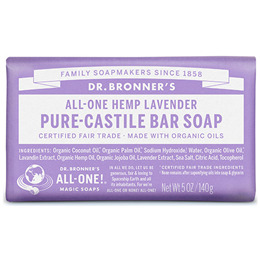 Below are reviews of Dr Bronner`s Lavender Castile Soap Bar - 140g by bodykind customers. If you have tried this product we'd love to hear what you think so please leave a review. Best bar soap I have ever used. Lovely lavender smell. Doesn’t dry my skin and rinses off well. I would have given it five stars but as it says on the wrapper that it contains palm oil, it is not 100% environmentaly friendly.